The hike up the mountain was a tough one. Flimsy patches of shade dangled from the trees but they were no match for the brutal Pennsylvania mid-summer heat. The rocky, three-mile vertical jaunt was only tamed by the fun being had along the way with the other camp counselors. We talked. We sang. We laughed. It was a week before the campers would arrive. All the counselors gathered for training that prepared us for the lessons and activities we would lead kids in all summer long. Caving was one of the optional camp activities so we went as a team of counselors to experience it before we led it. When we finally reached the entrance of the cave and stepped down into the mouth I breathed a sigh of relief. I’d never been caving before and I didn’t know what to expect, but the benefits of “no more heat” were very appealing to me those first few minutes. We grabbed our flashlights, turned them on, filed in one by one, and began moving down the dark entrance corridor. After I grew accustomed to the cooler temperature of the cave, I secretly got a bit freaked out by my surroundings. As passageways grew smaller and smaller and we trekked deeper and deeper into the cave, my mind flooded with questions. Is there enough air in here to support life? Who signed me up for this? What happens if we get lost down here? I have to crawl on my belly to go forward… wait, what? Yeah. For real. It was something else. I don’t think I’m necessarily claustrophobic, but let’s just say “comfortable and brave” aren’t the words I’d use to describe how I was feeling mid-cave. I strapped on my courage, breathed a steady stream of silent prayers, and stayed close to the friend in front of me as we followed the guide who was leading our group. This inner room was big enough for the entire group of counselors. There must’ve been at least 40 of us that day. We all loaded in and chit-chatted excessively. “Can I have everyone’s attention, please?” Our guide summoned us to silence. We ooohed and ahhhed, and tried our hardest to see… with no success. Then he lit a match. And the whole room was visible. Darkness was invaded. Conquered. Shoved back. Forced to flee and acquiesce to one itty-bitty source of light. And he began to tell a familiar story that stirred my soul in a fresh way. Then he went on to commission us for the work that lies ahead. He challenged us to be mindful of light’s impact and to go back to the campground and be that light all summer long. To the campers. To the counselors. To everyone we came in contact with. Gripped by the power of light. Gripped by this word that Jesus said describes me. IS me. Is my purpose… my calling… my commissioning – for that summer… this winter… every day. I am the light of the world. Not because of any glittery glow of my own but because I am handcrafted, redeemed, restored, and refined by THE Light of the World who blows away any and all darkness that tries to dominate. You are the light of the world too. And those around you in your family, your workplace, community, and even in your church are in great need of seeing an un-hidden, unapologetic light that serves and loves others in such a way that they would simply have to respond to God with praise. Go on now… light it up, today. Dear Lord, My heart is blown wide open when I think of the power You possess to not just impact, but annihilate darkness with light. Please forgive me for the times when I forget who I am in You and fail to shine. Help me to live and love in such a way that it would cause others to want to know and worship You. Read Psalm 27:1. What three names is God called by the psalmist in this verse? Should knowing Him as your light, salvation, and stronghold affect the way you live out your faith? Why or why not? 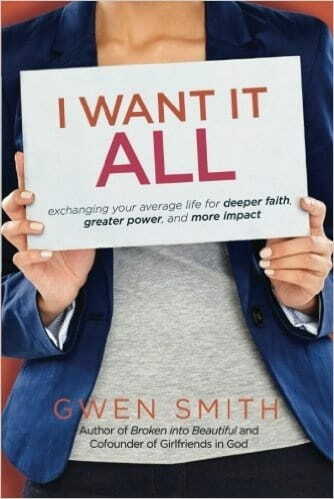 Gwen Smith is a speaker, worship leader, songwriter, and author of the new book, I Want I ALL, which includes a Bible Study Guide right in the back of the book; no extra purchase required. I WANT IT ALL is easy to read yet contains compelling and challenging content. You'll connect with the stories, probably dust off a few heart dreams, think bigger thoughts of God, laugh and smile a lot, search your soul, and even cry a little ... because each page lovingly directs you to the personal grace and truth of JESUS.